Of course, you are going to have to kill the monsters to get the treasure, and you aren't the crowd favourite today, and the cameras are very unforgiving. But there are no second takes, and if you die...YOU DIE! 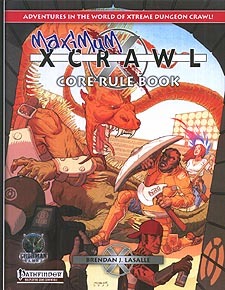 In Xcrawl, the players are superstar athletes taking their chances in a live-on-pay-per-view death sport. It's a modern-day world with a fantasy twist, and the game is simple: the Dungeon Judge, or DJ, creates an artificial dungeon under controlled - but lethal - conditions. He designs the maze, and stocks it with monsters, secret doors, magical traps, treasure and prizes. The players must go through the dungeon and fulfil whatever conditions the DJ puts forth in order to win.